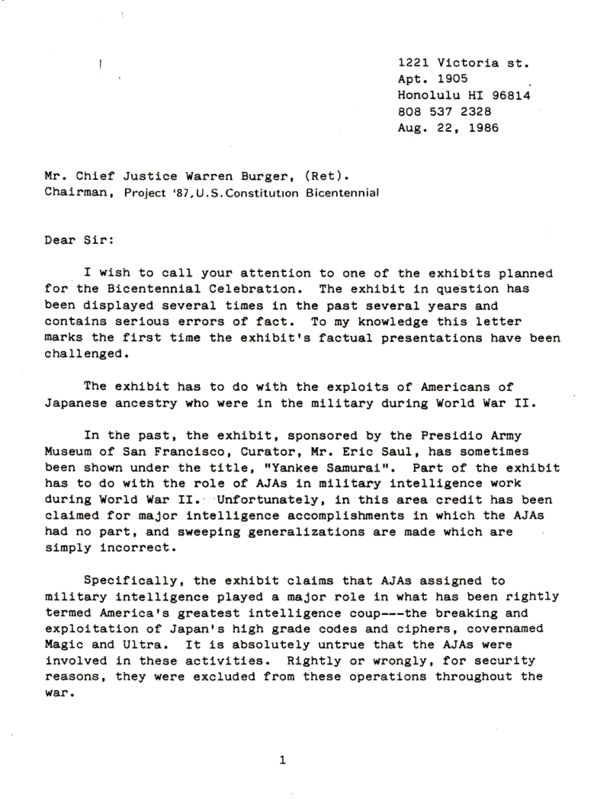 Document Notes: Letter from Lowman to Chief Justice Warren Burger, Chairman, Project "87, U.S. Constitution Bicentennial, urging that exaggerated claims of Japanese American contributions to the WW II effort be eliminated from any displays sponsored by the Project. They weren't in the Smithsonian exhibition and later caused a great deal of embarrassment to the Institution when shown to be wrong. Those interested may read the critique that brought about the changes at www.athenapressinc.com/smithsonian. The exaggeration and outright fabrication of achievements by Japanese Americans during World War II is likely a subject of shame to many honest Japanese Americans.